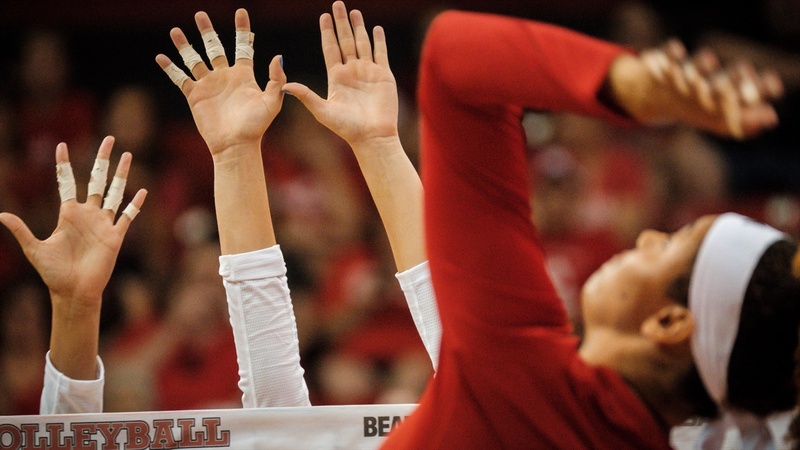 Nebraska volleyball fans will get both their first look at the new-look Huskers and an opportunity to look back at the 2017 championship season at the annual Red-White Scrimmage on Saturday. The Huskers, with a roster including eight newcomers, will take the court at the Devaney Center in front of a sold-out crowd, and afterward Nebraska will play NET’s documentary, “Nebraska Volleyball: Culture of a Champion,” on the video board. “To me it’s an appreciation day for Nebraska volleyball and our fans and the support that we get, and we never want to take that for granted,” Coach John Cook said. The Huskers shared their appreciation for the fan support, but weren’t at all surprised by the sellout; it’s what they’ve come to expect from the Husker faithful. This year’s team features seven true newcomers who have yet to experience playing at the Devaney Center (senior Brooke Smith transferred back after spending last season at Kansas State), and the upperclassmen have tried to prepare the freshmen especially as best they can. Saturday won’t be Hames’ first time in the Devaney Center on a game day, but watching from the sideline and suiting up are two very different things. Cook said he hasn’t yet decided on the format for the scrimmage in terms of roster make-up, but former Huskers Kadie and Amber Rolfzen are slated to participate. Texas transfer Lexi Sun’s status, on the other hand, is up in the air and Cook will determine what role she might play on Saturday with input from trainer Jolene Emricson. Sun has been limited in practice but everyone else should be full-go. In fact, though she said they could definitely use the extra week of practice, Maloney thinks the Huskers would be ready to take on No. 7 Florida and No. 18 Oregon this weekend if they had to. Cook isn’t quite as convinced of that, but his goals for the scrimmage are simple. “My goals are to have everybody play a significant amount and then have our crowd create a game-like atmosphere that we’re going to experience next week, because we’re going to have eight new players that haven’t experienced the Devaney before, so we’ve got to simulate it so we’re not going through that next weekend when we’re playing Florida and Oregon,” Cook said. Typically, coaches like to downplay the importance of public scrimmages. That wasn’t the case for Cook on Friday, however. Hames shared some of the things the setters are focusing on in practice as they battle it out for the top spot. Hames said the setters are getting a little extra practice time in as they make the adjustment to setting at Nebraska (or in Smith’s case, setting at Nebraska again). Another spot up for grabs is the third middle blocker position. The Huskers currently have two true middles on the roster, but Cook has been working in practice to develop a third from a group of outside hitters. Cook said that sophomore southpaw Anezka Szabo, who played opposite hitter as a freshman, had the best stats at that spot this week and she was working with the middles during practice on Friday. Finally, Cook needs a second outside hitter to emerge behind All-American senior Mikaela Foecke. With Sun limited, sophomore Sami Slaughter and freshman Capri Davis have a big opportunity in front of them at that spot. First serve on Saturday is set for 3 p.m. with the 35-minute documentary to follow. Fans not at the scrimmage can catch the documentary’s debut on NET on Sunday at 5:30 p.m.